A2Z staff arrived on January 23rd to find a notice on the door that the school had closed. Students similarly were left high and dry. Despite the fact A2Z is doing just fine financially elsewhere, Dublin staff are still awaiting payment. 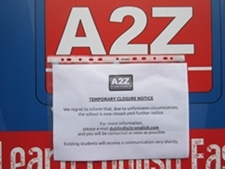 In response to pressure from staff and students, A2Z Dublin have blocked access to their Facebook page. This story is all too familiar in language schools and, indeed, it mirrors the way our bosses treated us when our school closed down in early January. We’ve been involved in a campaign, detailed here, to secure our unpaid wages as well. But, whatever they may believe, TEFL bosses are not invincible. A dedicated workforce, bolstered by outside solidarity, can make bosses treat us with decency and respect. Don’t give up the fight and if there’s anything we can do to support, please don’t hesitate to let us know. Whatever they may believe, TEFL bosses are not invincible. A dedicated workforce, bolstered by outside solidarity, can make bosses treat us with decency and respect.